Data is offloaded via USB to a PC or Mac computer. An alarm display and built-in relay for use with Onset's Remote Alarm and/or Autodialer accessories assure timely notification of alarm conditions. Time accuracy: ±1 minute per month at 20°C . 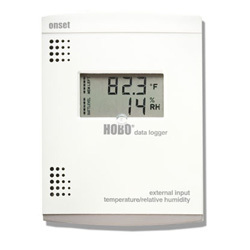 12-bit Temperature/Humidity Smart Sensor for use with all Hobo Loggers that can accept "Smart Sensors". Comes with 2m cable. 12-bit Temperature/Humidity Smart Sensor for use with all Hobo Loggers that can accept "Smart Sensors". Comes with 8m cable.